Tortoiseshell cats make more than good pets, they have a very rich history and a place in folklore in many different cultures. Although we know that the beautiful tortoiseshell pattern comes from the result of a complex genetical pattern that is only found in female cats, the Khymers of South East Asia believed that the first tortoiseshell arose from the menstrual blood of a goddess born of a lotus flower. Black cats have always been regarded as lucky, but stories about torties in particular go back to ancient times when the Celts believed that tortoiseshell cats brought good luck to their homes. 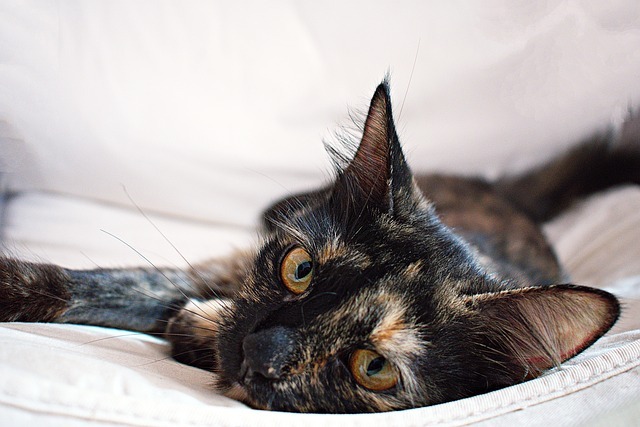 It is still regarded as good luck in both Scotland and Ireland if a stray tortie settles in your home, and we certainly believe that any home with a tortie is a lucky one! Male tortoiseshell cats are very rare (only about 1 in 3000 tortoiseshell cats are male), and perhaps this is why Japanese fishermen tried to carry a male tortoiseshell on board their ships to protect them from ghosts and from storms out at sea. There is also an English old wives tale that you can cure warts if you rub them with the tail of a male tortoiseshell cat during the month of May. We are not so sure about that one! Perhaps our favourite story about torties is that if you are lucky enough for a tortoiseshell cat to appear in your dream then you will enjoy good fortune in love. Let us know if you know any other stories about torties in folklore or if they are a lucky charm for you and your family.